The internet has become somewhat of a war zone in recent years. Between avoiding the constant deluge of sensational news stories, trying to dodge the cybercriminals and just endless cookie consent boxes and pop ups, it can eventually end up causing you more problems than it’s worth. It’s not hard to suddenly think that you’ve had enough of the internet and that it’s time for you to leave it in the rear view mirror. If that’s you, or you’ve at least considered it, then check out this awesome infographic from WD Storage. 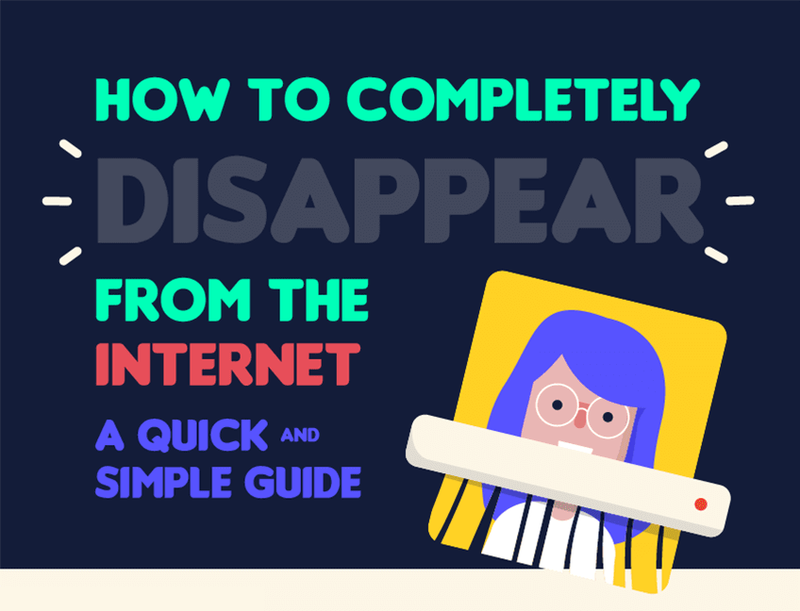 It lays out in simple terms how to remove yourself from the internet, starting with removing yourself from social media going all the way up to total anonymity on the internet (if there ever was such a thing!). Why would you want to do this? Roughly 2.5 billion megabytes of data is created every day, a lot of that being personal data. Hackers mine personal (including financial) data and sell it online. Not only that, almost all prospective employers say they now check social media before hiring a candidate, meaning you might want to get rid of that questionable tumblr account you made in your teens. So, let’s start with social media. Social media has taken over the world in a short time. Facebook has over 2 BILLION users. Recent studies have shown that many young people attribute their anxieties, depression and other self-image issues to social media and that anxiety has doubled amongst young people in the last 10 years. On top of that, we’ve recently seen the fallout from the Facebook fiasco, where companies like Cambridge Analytica made no bones about how they use data gathered from Facebook, which may have been a key factor in political watershed moments like Trump’s presidential campaign and the EU referendum in the UK. Facebook also plan to merge WhatsApp and Instagram data into Facebook, they have conducted experiments on their users without permission in the past and share your personal data with third parties! You may have also heard of or experienced ‘headline stress disorder’. Regardless of your political persuasion or what side you fall on in the culture wars, the online journalism model has led to a constant bombardment of click-baiting, sensational headlines on all platforms at all times. Even if you take the time to read the articles and find that most of them are misleading at best, if not completely trumped-up, these constant headlines of doom and gloom stay with you after you’ve logged off. Looking solely at the news, it’s hard to be optimistic about the world at the moment and one thing you can do is to shut yourself off from social media for a while, if not completely. Click on ‘Your Facebook Information’. If you are using a desktop, select the ‘Delete your account and information button’. If you’re on a mobile, you need to go to ‘Account ownership and control’ > ‘Deactivation and deletion’. Select a temporary or permanent deactivation. Right at the very bottom, there is a ‘Deactivate your account’ button. Head to ‘Settings and Privacy’. Go to your profile page and scroll to the bottom. Head to ‘Managing your account’ > ‘Delete your Account’. Confirm your intention when prompted. That’s how you remove yourself from four of the most popular social media networks in the world. Lots of people report being much happier and stress-free since deleting social media. You have to be prepared to lose touch with some people if you do this. On the flip side, it forces you to go to extra effort to reach out and keep up with the people you really care about and ostensibly, removes lots of superficial online ‘friendships’. If you find yourself concerned or bothered about your social media but don’t want to go the full hog and deactivate them all, then it’s time to purge! Go through who you follow or are friend with and assess whether you should be. Old friend from school can’t stop talking about Love Island? Unfollow them. On Facebook, you can unfollow people without unfriending them and they don’t know you’ve done it. Go through who you follow on Twitter and Instagram as well and assess whether you need to be following them. You may find you enjoy using social media more when it’s been carefully curated so that you only receive updates form close friends and accounts you like to see content from. After social media, you need to Google yourself so you can delete your appearances in search. This is for those that want to go a step further in the quest for online anonymity. There’s probably a ton of websites that you’ve signed up to before in the past. That information stays on the internet, and it’s up to you to scrub yourself from the search results. A landmark court trial has seen EU citizens earn the ‘right to be forgotten’. An unnamed businessman who served six months in jail for a non-violent white collar crime found that they could not move on with their lives as every Google search of their name instantly returned results about a conviction they served ten years ago. If you are in the EU, you also have this right and can fill out a lengthy form to appeal your right to be forgotten. Use private mode or browsers and search engines like DuckDuckGo who don’t collect personal data. Go completely off the grid by turning off all your location services and GPS. Google make a note of your location every time you search something as well as other apps that track your location whilst using it. Don’t get us wrong, the internet has provided us with just about as much good as it has bad and if these things don’t bother you or you browse the internet responsibly, then keep on trucking! If you want to strip your life of fancy internet technologies and dependencies, or simply just unplug from it all for a while, then follow WD Storage’s steps. You can then enjoy your new life free from notifications, pop-ups and embrace your new anonymous existence.